Goodman Theatre is proud to support Chicago’s off-Loop theater companies Teatro Vista, Definition Theatre Company and Collaboraction as a producing partner on several high-profile productions this summer—two of which open this week. The Chicago premiere of Branden Jacobs-Jenkins’ An Octoroon, which recently opened at Victory Gardens, is directed by Goodman Resident Director Chuck Smith. Teatro Vista’s La Havana Madrid by Sandra Delgado opened at the Goodman in the Owen Theatre, following two sold-out previous engagements (at Steppenwolf Theatre Company and The Miracle Center in Logan Square). Directed by Cheryl Lynn Bruce, La Havana Madrid was developed in 2015 during Delgado’s time as a member of the Goodman’s Playwrights Unit—a year-long program for Chicago-based writers, and a significant component of the Goodman’s new play development efforts. Collaboraction’s PEACEBOOK —24 social-issue driven short performance pieces rendered by more than 200 artists in a city-wide festival of theater, dance, music, visual art and spoken word—launches at the Goodman on August 26 in the Owen Theatre, followed by tours to south, west and north side neighborhoods in Chicago Park District’s Nights Out in the Parks program. Over the past two decades, the Goodman has served as a production partner (providing financial support and/or physical space) for dozens of projects, including an unprecedented three-year residency with Teatro Vista that resulted in producing the new works El Nogalar by Tanya Saracho, Cándido Tirado’s Fish Men and Quiara Alegría Hudes’ The Happiest Song Plays Last. Other previous partner organizations include Aguijon Theatre Company, Albany Park Theater Project, Black Ensemble Theater, Collaboraction, Congo Square, Court Theatre, eta Creative Arts Foundation, Fleetwood-Jourdain Theatre, Lookingglass Theatre Company, MPAACT, Pegasus Theatre Company, Rivendell Theatre Company, The Second City, Silk Road Theatre Project, Teatro Luna, The Hypocrites, The Neo-Futurists and the Theatre School at DePaul University. In La Havana Madrid, Chicago’s eponymous 1960s nightclub comes bursting back to life in “an immersive, wholly enjoyable experience” (Chicago Reader) complete with live music and “enough dancing and bonhomie to tempt you away from your little table down front” (Chicago Tribune). Inspired by true stories of Cuban, Puerto Rican and Colombian immigrants who found refuge in the nightclub, Delgado leads the eight-member cast as a mystical woman who conjures stories and vibrant songs performed live onstage each night by Colombian-American musician Roberto "Carpacho" Marin and his band of 30 years, Carpacho y Su Super Combo. La Havana Madrid appears through August 20 in the Owen Theatre (Opening Night is Wednesday, July 26 at 7pm). Tickets ($30-$50; subject to change) are available at GoodmanTheatre.org/LaHavanaMadrid or (312) 443-3800. La Havana Madrid is recommended for ages 12 and up. A modern riff on Dion Boucicault’s 1859 classic melodrama, The Octoroon, Branden Jacobs-Jenkins’ Obie Award-winning historical satire An Octoroon directed by Chuck Smith follows a plantation in financial ruin, the tumultuous love story of its heir apparent, the evil overseer plotting to take it all for himself and the slaves trying to keep it all together. Hilarious, pointed and provocative, An Octoroon offers up a subversive take on race in America–both then and now. An Octoroon appears through August 20 in the Richard Christiansen Theater at Victory Gardens Theater (2433 N. Lincoln) as part of Definition’s tenure in the Victory Gardens Resident Theater Program. For tickets, call 773.328.2136 or visit VictoryGardens.org/AnOctoroon. More than 200 artists unite for Collaboraction’s PEACEBOOK—a free, collaborative city-wide festival of short theater, dance, music, visual art and spoken word pieces in support of Chicago’s peace movement. The 24 “chapters” of PEACEBOOK are each seven minutes or less in length, and range from solo works to large collaborations. Arts/activists involved include David Dastmalchian (Twin Peaks), Sandra Delgado (La Havana Madrid), GQ (Q Brothers), Kevin Coval (Louder Than a Bomb), director Mignon McPherson Stewart, Sir Taylor (Example Setters) and Bril Barrett (Making a Difference Dance). PEACEBOOK launches on Saturday, August 26 in the Owen Theatre. Show times are 3pm (PEACEBOOK Englewood), 5:30pm (PEACEBOOK Hermosa) and 8pm (PEACEBOOK Austin). To reserve tickets and for more information, visit www.collaboraction.org/peacebook2017, email boxoffice@collaboraction.org or call 312.226.9633. Deﬁnition Theatre Company is an ensemble-based Chicago theater founded by six graduates of the University of Illinois at Urbana-Champaign. Featuring a multi-ethnic core companionship of actors, Definition strives to artistically reflect the myriad of modern America to inspire and engage the communities it represents through contemporary and classical theatrical works. Our mission is to tell language-driven, relationship-oriented, thought-provoking, socially relevant stories. Deﬁnition has been afforded the opportunity to create work that reﬂects its unique voice. It shared the words of Academy Award-Winner Tarell Alvin McCraney in The Brothers Size, it grooved with Amiri Baraka's whirlwind story of a chance meeting on a train in Dutchman, and staged its first world premiere production, Genesis, written by ensemble member Mercedes White and inspired by Lorraine Hansberry’s iconic masterwork A Raisin in the Sun. Most recently, Definition partnered with The New Colony to produce the world premiere of Byhalia, Mississippi. Hailed by the Chicago Tribune as “wise, funny, thoughtful and true”, Byhalia, Mississippi explored a family in turmoil and a small southern town haunted by its racially-charged past. Ensemble members include Owais Ahmed, Carley Cornelius, Martasia Jones, Kiki Layne, Kelson Michael McAuliffe, Julian Parker, Tyrone Phillips, Christopher Sheard and Mercedes White. Artistic Advisory Board members include director May Adrales, Steppenwolf Ensemble Member Alana Arenas, actress Shannon Cochran, Victory Gardens Theater Managing Director Erica Daniels, actor Brandon Dirden, actor Jason Dirden, Writers Theatre Artistic Director Michael Halberstam, director Pam Mackinnon, professor JW Morrissette, director Ron OJ Parson, professor/lighting designer Kathy Perkins and Tony Award-winning actress and stage director Phylicia Rashad. Tyrone Phillips is the Artistic Director and Neel McNeill is the Managing Director. For additional information, visit definitiontheatre.org and facebook.com/definitiontheatrecompany. Teatro Vista’s 2017/2018 season opens with La Havana Madrid at Goodman Theatre. Teatro Vista produces, develops and commissions plays that explore the wealth and variety of the human experience from a Latinx perspective. The company provides work and professional advancement opportunities for Latinx theater artists, with special emphasis on the company’s ensemble members, and seeks to enhance the curricular goals of Chicago students through theatre. Teatro Vista was recently celebrated as one of “Chicago’s Cultural Leaders” by the Arts & Business Council of Chicago and received the League of Chicago Theatre’s Artistic Leadership Award. For the development of La Havana Madrid, Teatro Vista and Delgado received from The Chicago Community Trust, and the 2015 Joyce Award. Delgado also received a 3Arts 3AP Project Grant and developed the script as a member of the 2015/2016 Playwright’s Unit at Goodman Theatre. Teatro Vista is supported by The Joyce Foundation, the Chicago Community Trust, Alphawood Foundation, Paul M. Angell Family Foundation, The MacArthur Fund for Arts & Culture at the Richard H. Driehaus Foundation, Bloomberg Philanthropies, the Department of Cultural Affairs and Special Events of the City of Chicago, The Shubert Foundation, The Gaylord and Dorothy Donnelly Foundation, the Chicago Latino Theater Alliance, Purple Group, Cumberland Irving and Vidal & Associates, Inc. and The Saints. For more information, visit TeatroVista.org, on Twitter (@TeatroVista), Facebook and Instagram. Collaboraction (collaboraction.org ) collaborates with artists, community activists, and citizens from throughout the city to create original theatrical experiences that push artistic boundaries and explore critical social issues with a diverse community of Chicagoans. Collaboraction has worked with over 3,000 artists to bring more than 60 productions and events to upwards of 250,000 audience members. Production highlights include Collaboraction’s acclaimed series of Crime Scene productions responding to Chicago’s current crime epidemic, 15 years of the SKETCHBOOK Festival, Sarah Moeller’s Forgotten Future: The Education Project in 2014, 2010’s Chicago premiere of 1001 by Jason Grote, 2008’s world premiere of Jon by George Saunders and directed by Seth Bockley, and 2007’s The Intelligent Design of Jenny Chow: an instant message with excitable music by Rolin Jones. Collaboraction, based on the third floor of Wicker Park’s historic Flat Iron Arts Building with three theatre spaces, is led by Artistic Director Anthony Moseley and a dedicated staff and board of directors. Collaboraction is supported by Bloomberg Philanthropies, The Gaylord and Dorothy Donnelley Foundation, Richard H. Driehaus Foundation via the MacArthur Foundation, and the Wicker Park & Bucktown SSA #33 Chamber of Commerce. This program is partially supported by a grant from the Illinois Arts Council Agency. For tickets and information, visit collaboraction.org or call 312.226.9633. 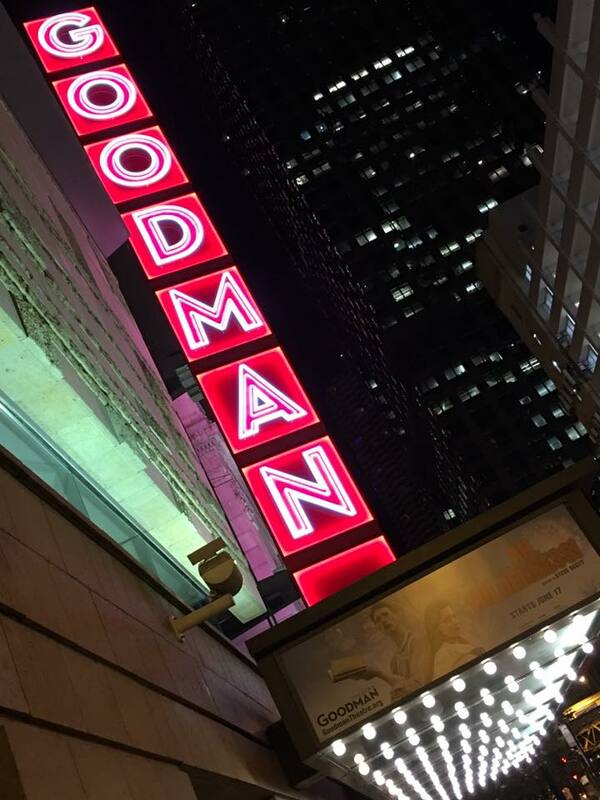 Visit the Goodman virtually at GoodmanTheatre.org —including OnStage+ for insider information—and on Twitter (@GoodmanTheatre), Facebook and Instagram.